‘Madama Butterfly” is a heartbreaker of an opera. Before its devastating final scene, the heroine Cio-Cio-San suffers every form of betrayal from those she loves and trusts. But there is one relationship that stays true from beginning to end: the enduring bond between the wronged geisha and her loyal friend and servant Suzuki. 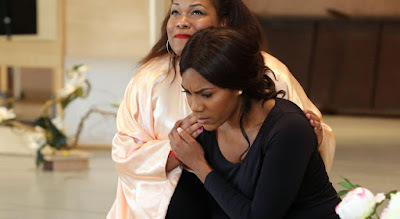 Realistically creating that sisterly connection onstage won’t be very difficult in the San Diego Opera’s production of the Giacomo Puccini classic, which opens Saturday. The women playing those roles — Latonia Moore as Cio-Cio-San and J’nai Bridges as Suzuki — have been friends for years, deeply admire each other’s work and are so comfortable together they can practically finish each other’s sentences. The American singers both found their musical roots in the black church singing gospel, they both went to graduate school in Philadelphia, they both launched their careers singing in prize competitions, and they both love to let loose singing karaoke (Moore loves ’80s rockers like Pat Benatar, while Bridges prefers soul singers like Toni Braxton). And this year, both women are having major career breakthroughs. Moore, a soprano, will make her official Metropolitan Opera debut in November in the title role of “Aida” (she has sung two nights at the Met as a fill-in for ailing singers, but this will be her true headlining premiere). And Bridges, a mezzo-soprano, has just won prizes in two of the most prestigious vocal competitions in the world, a Richard Tucker Career Grant and the Francisco Viñas International Competition in Spain. The major difference between the women is that while Bridges is just launching her professional career, Moore has been an in-demand singer worldwide for years. She has sung her signature role of Aida nearly 100 times.